The season 2003-4 was to be remembered for all the wrong reasons by County fans. Beginning in administration, they ended it on a slightly higher note - they were still in existence. The ownership changed, the manager changed and the Supporters Trust began - playing an integral part, not only in rallying fans to the stricken club's aid, but also providing funds to enable the squad to be strengthened. Bought from non-league Gedling, Steve Scoffham joined the Magpies and was an instant hit - scoring twice before breaking his leg on the last day of the season. Following all this ? Well, don't despair. The matches had to be played just as usual. Well, almost as usual. 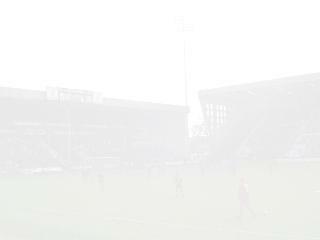 There was the question of the clubs 'last game' - scheduled to be a home fixture against Luton on 6th September 2003. It wasn't, as it turned out, a saviour had already come forward, but few will forget the glorious sight as visitors from many other league clubs came to watch the fixture - dressed in their own clubs colours. Hostilities against Forest were also suspended for the day with a self imposed ban on some of Z Block's favourites ! As we know, the team survived but not in the same division, not with the same manager and not, ultimately, with the same squad. There were some high spots though. A good run in the league cup led to an away fixture against Chelsea at Stamford Bridge. Despite the stinginess of the Blues defence, Notts scored two before going down. However, as the Premiership stars donated their shirts to the Notts cause and the gate receipts also provided a boost to the coffers, there were no real losers that day. The match bought a welcome surge of publicity to the club with features on 'Football Focus' and decent highlights. Similarly in the FA Cup, Bill Dearden's men advanced to a clash with top flight opponents - succumbing away to Middlesborough. These games were bright spots in an otherwise traumatic and turbulent season that saw the departure, on purely financial grounds, of the charismatic striker Mark Stallard who moved to Barnsley in January 2004. They thought it was all over.... and indeed it was when former player Gary Mills oversaw relegation to League 2 - or, to translate that into English, Division 4. The 2003 - 2004 kit was sponsored by Fascia Mania - the logo was on all the replica shirts from the beginning of the season onwards so you're unlikely to see a 'clean' shirt as you did with the Paragon 140th's of the year before. However, there are two different logo designs for the front (one has the website address on if you really MUST know) Whilst we're on the subject of minor discrepancies, if you got a shirt later on in the season (when the club came out of administration), the quality of the Notts badge was much better - not just you either. The players who came into the squad halfway through got the same. Before the season was a couple of months old, the Football League issued a new law concerning teams with a striped kit. They were obliged to have a plain box on the back into which the number and name could be added. Notts, still short of cash, had given each player only one home shirt but were now obliged to replace those. 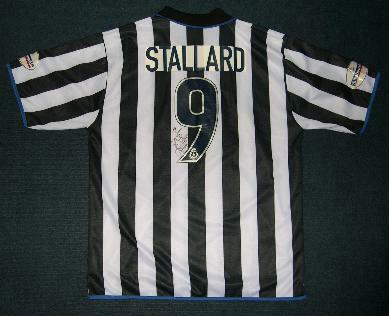 Therefore, the early design - notable because the number was added over the stripes and the letters were in a seperate white box above, was phased out. Its last appearance was in the game against Luton. 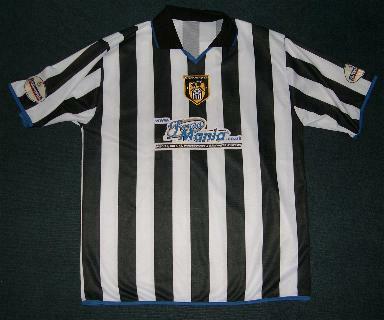 The players shirts came up for sale in the club shop over the summer of 2004. These shirts started the season but didn't go beyond September.